A merged, all-in-one patch for almost all of the Creation Club content, with numerous bugfixes and improvements. Midgetalien for graciously allowing the inclusion of his Arcane Accessories patches. Changed name back to All-In-One. Updated mod to contain fixes for all the currently available Creation Club files that can be opened in the Creation Kit. 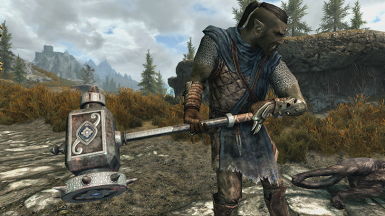 If you haven't got Dwarven Armored Mudcrab and Shadowrend, stick with the previous version or use the separate files instead of the All-In-One. Added secondary file containing a merge of the two Unofficial Updates for the CC files which cannot be opened in the Creation Kit - Lord's Mail and Nix-Hound. The two files are independent and can be installed separately or together. The mod now uses a .bsa file instead of loose scripts and seq files, for general data folder cleanliness. Fixed a minor bug where the wrong version of one of the robes was added to the levelled lists. Set "My Pet Mudcrab" to no longer start on installation. It now starts when the player reads the "Notice of Sale" which is delivered by the courier after the player has defeated Nimhe for Calcelmo. The Dwarven Mudcrab is now combat-ready! He can now both attack and be attacked - but he's essential, so he won't die. Just bear in mind that he is a mudcrab, so won't be much of a match for Alduin. Increased carry weight to 150 so the mudcrab is now actually useful. Prevented "Gift of Kynareth" from starting on installation - you must now first read the "Letter to General Tullius" in Castle Dour. Corrected typographical issues in "Letter to General Tullius". Corrected typographical issues in "Majid - Please Read". "My Pet Nix-Hounded" no longer starts automatically, and is now started by reading the note on the bar in the Retching Netch. The Nix-Hound pet is no longer invulnerable (but is still essential). The Nix-Hound pet can now fight. Increased the Nix-Hound pet's level from 2 to 10. Fixed a bug where Zombies would not make sounds. Set "Through a Glass, Darkly" to only start once you stumble across Shadowrend in the Eastmarch geysers. Fixed crash when crafting certain staffs. Correctly applied AoE to the staff flames fear effects. Fixed incorrect base enchantment for ccBGSSSE014_EnchRobesFortifyDestructionAndAlteration02. Fixed a bug preventing the "Unbounded" spells from being properly added to the leveled lists. Slightly streamlined file to reduce dependencies on external scripts. Existing users need not update. Set "No Absorb/Reflect" flags for the Conjuration spells so that players with spell absorption can still cast them. Set a "No Absorb/Reflect" flag for Pride of Hirstaang so that players with spell absorption can still cast it. Minor fix to prevent missing quest descriptions for those installing on a save that has already been loaded with CC content (still not recommended). The new robe enchantments can now be applied once disenchanted. Thanks to Midgetalien for the fix. Squashed an almost certainly harmless xEdit Unused Data error. 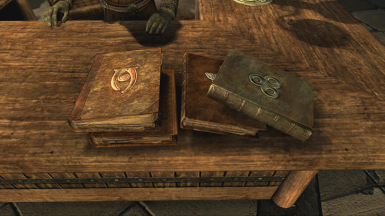 Set "The Lost Library" to start when you read the note in Tolfdir's room instead of on installation. 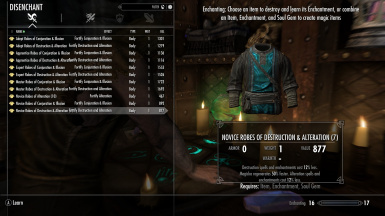 Removed the free robes the player was automatically gifted on installation. Added a "Familiar" visual effect to the conjurable bear. The new robes are now disenchant-able. 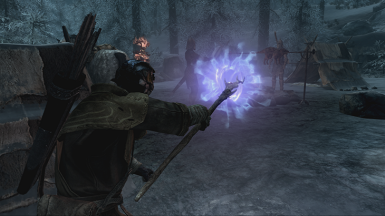 Added staffs for each of the new non-named spells. 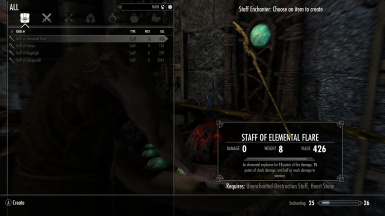 New staffs can be created with the staff enchanter. 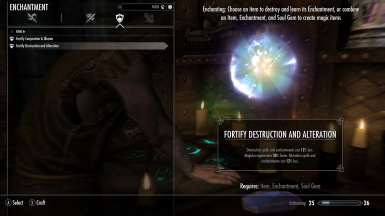 New staffs and un-enchanted robes have been added to the leveled lists via Bethesda's setup script, and named spells (Fenrik's Welcome, Mara's Wrath etc.) have been removed. Please note these leveled list changes are not retroactive. Added a compatibility patch for Magical College of Winterhold that moves Tolfdir's Note to his dresser's new position. Paralysis Rune: changed level from Adept >> Expert, and increased base cost from 220 >> 400 to be more in line with "Paralyze"
Fenrik's Welcome: Increased cost from 250 >> 450. Removed "Unbounded" Spell Tomes from the chest in "The Lost Library". These can now only be obtained after completing "Destruction Ritual Spell". "Stealer of Souls" and "Swift as an Arrow" will no longer start on installation. "Stealer of Souls" now starts via courier delivery of "Letter from Calcelmo". 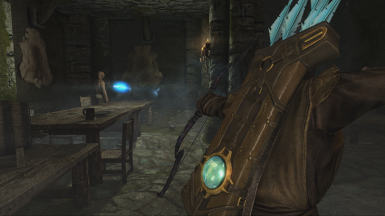 "Swift as an Arrow" now starts via courier delivery of "Note from Calcelmo" after "Stealer of Souls" has been completed. Fire, Ice and Lightning Arrows now correctly deal elemental damage. Soul Stealer Arrows only activate on a lethal hit, and do not instakill NPCs. The "Letter from Calcelmo" which starts "Stealer of Souls" will now only be delivered once the player has met Calcelmo for the first time. Fire Arrows now ignite pools of oil. Set "The Lost Paladin" to start when you read the note in General Tullius' quarters instead of on installation. Carried forward a couple of small USSEP changes. Set "Relics of the Crusader" to start when you read the letter on the dead courier's corpse instead of on installation. Improving the Reforged Armor of the Crusader now benefits from the Advanced Armors Perk. Set "The Rising Dead" to start when you read the note in the Bee and Barb instead of on installation. Resolved a very small USSEP conflict. 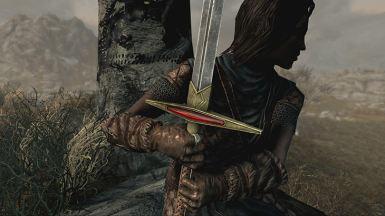 Set "The Edge of Ruin" to start when you collect the map in Jorrvaskr instead of on installation. Set the quest to only appear in the player's journal when they collect the Fork and Mysterious Note in the Retching Netch. Set "If I Had a Hammer" to start when you read the note in the Ragged Flagon instead of on installation. I hate it when quests start automatically. Be it a mod, a DLC pack, or whatever we're calling the things you download from the Creation Club, if installing it causes a quest to just appear in my journal, I'm not a fan. It's immersion breaking, for one. Download a few things from the CC, and all of a sudden I have to accept that my character has heard three rumours and received a haul of mail in one go - while at the bottom of a dungeon, no less! I have therefore taken it upon myself to rectify the situation! I've worked my way through all the files on the Creation Club (except Survival Mode) one by one, making it so that the quests start in more immersive ways. I also made a number of bugfixes and improvements as I found them, generally polishing up the files to the standard they should have been at on release. With this patch installed, none of the quests will automatically start when you load the game. Instead, you'll have to discover a collection of letters, notes and maps that I've scattered across Skyrim and Solstheim in organic, lore-friendly places. Reading these should cause the quests to start, after which they'll proceed as normal. As I mentioned above, I've also made a fair few fixes and improvements, many of which I came up with at 1 AM, fuelled by purest Earl Grey. What can I say, I'm British. See the Changelog for details of these. I strongly recommend that you do not install this patch on a save file that has already been loaded with any of the Creation Club Content installed. If you do, it won't break your game, but you won't benefit from some of the fixes and you may experience unusual quest behaviour. The only exception for this is if you were already using all of my separate Creation Club patches and are simply switching across to the merged version, in which case you shouldn't notice any change. If you do, please report it in the Bug Reports section. The patch comes in two files. The main file covers most of the Creation Club files. The secondary file contains fixes for the two Creation Club files which cannot be opened in the Creation Kit without it crashing. I have to keep these separate so I may continue to use the Creation Kit for the majority of the Creation Club files. To my knowledge, Adventurer's Backpack, Camping and Tundra Homestead do not need any fixes. Don't have all of the Creation Club content? Use the separate Unofficial Creation Club Updates (linked below) instead! 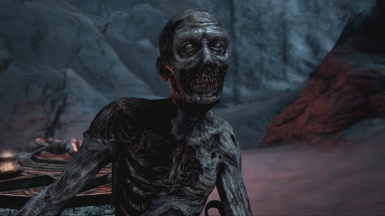 Unofficial Plague of the Dead Patch﻿ - This patch consists solely of a minor change to the Plague of the Dead quest record to remove a harmless Papyrus Log error, and is completely overwritten by this Unofficial Update. Choose one or the other. I am not the original author of the Creation Club files that this patch depends upon. This patch is not supported by the original author(s), in any way, shape or form, and is an independent mod with its own responsibilities and faults. Make sure you have all the required files downloaded and installed from the Creation Club. Download and install the patch, preferably using NMM or MO. If you want to do it manually, it should be as simple as dragging and dropping the .esp and .bsa files into your "data" folder. You don't need the source files unless you plan on making changes to my patches yourself.